"Kids today are amazing. I played winter ball down in Venezuela, they had kids half his age, every one of them speaking Spanish. That's a hard language." When I was twelve years old I was obsessed with baseball. I collected the cards, dreamed of someday pitching on a big league mound while throwing a no-hitter in the World Series, and I was probably the only kid who was more interested in keeping score at the games I attended than the action seen on the field. Watching Little Big League, I was reminded of my love for the game; how everything seemed so pure—until I grew older and witnessed the business side of the sport. Little Big League is that rare film that portrays the love of the game from a child's point of view, and how the adults who play baseall lack it. Like most young children Billy Heywood (Edwards) loves baseball more than his school work, though his abilities in Little League leave a lot to be desired. He is lucky that his grandfather (Robards) is the owner of the Minnesota Twins, something that grants Billy access to the players as well as a wealth of baseball knowledge. Billy's grandfather wills him his share of the team, thinking that Billy will be older when he inherits it, but he isn't. With his ownership, Billy's life begins to take a new direction, focusing on the front office aspect of the team rather than intrude on the overly angry manager (Farina) and the other players. Soon Billy fires the manager, decides that he is the best candidate for the job and becomes the youngest manager in the history of Major League Baseball. With his new title, Billy begins to alienate his players, many of whom feel that taking orders from a twelve-year-old is not something a big league ballplayer should be forced to do. With Billy's help, the team becomes re-enamored with the game and makes a serious bid at the postseason. Little Big League is filled with such unabashed love for the game that it becomes easy to overlook the shortcomings of the overly predictable script. We know from the outset that everything will end up with one big game, but it is nice that the outcome is unexpected. The steps that the script takes to get to that game are standard, in that those players opposed to Billy will undoubtedly come around, and others who respect him will ultimately play their hearts out. The saving grace is that the story is as enthusiastic about baseball as its hero, and shows nearly every side of the sport very well. Billy may know a lot about baseball, perhaps too much, but the changes that he faces are admirable in the way that they buck the trend of other family baseball movies. This is a sports movie made by people who enjoy baseball and for that I am grateful. Overall, the film is enjoyable, perhaps more so than the similarly-themed Rookie of the Year. Luke Edwards does a nice job as Billy, changing his emotions with the script as the season goes by. Timothy Busfield and Jonathan Silverman are standouts amongst the players, while Jason Robards does a wonderful job in his brief screen time. 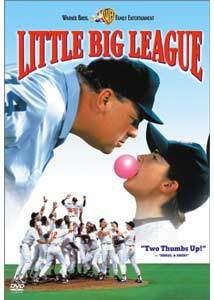 Little Big League is touching, thrilling, and easily enjoyable for children and adults alike. Image Transfer Review: For reasons beyond my comprehension Warner Bros has decided to release Little Big League in a slightly cropped, full-frame transfer. Though little is lost in terms of information, I am still baffled as to why this was done. Colors are good, while sharpness and detail are a bit soft in their appearance. Black levels looked fine, though they did show some grain. This is only an average transfer. Audio Transfer Review: The Dolby Digital 5.1 mix is only an average track with most of the action coming from the center speaker. The rear channels come alive in the baseball sequences as the sounds of the crowd come through the split surrounds. The .1 LFE track is mild, with little to no bass present. Extras Review: The special features offered for Little Big League aren't many, but they are fun none the less. A five-minute making-of leads off the list and it is informative for kids, though it is largely promotional. An interactive feature titled Let's Play Ball is the strangest feature as it aims to help players with their game, but only shows a small clip of a hitter swinging or throwing. Okay. Finally, trailers for Little Big League, Willy Wonka and the Chocolate Factory and Wizard of Oz as well as a cast and crew screen round out the extra features. Though I am a bit disheartened by the lack of support for a widescreen transfer, Little Big League is an absolute gem of a film for younger audiences. Recommended for families that love baseball.